This story has been around for six months. I’ve wanted to share with you all because it’s hilarious and completely ridiculous, but I wanted to save it until I could tell it from beginning to end. If you attended language school with us, you know it well. About three months in to our time here in France, the exact time it takes to get fairly adjusted to living in a new place, we began to get frustrated with how little time we had. My husband, who loves logistics, calculated several areas of our life out and found a solution. He then decided one purchase would be a joint 30th birthday present to the both of us. American Thanksgiving was approaching and we were hosting several people at our apartment. Matthew ordered the surprise on amazon, and it was supposed to arrive on Wednesday, the day before Thanksgiving. He wouldn’t tell me what it was, only that it would be a lifesaver in the kitchen. I was dubious. Wednesday arrived and he popped over to the main building first thing, to see if the package had arrived. Not yet. Every hour, he was there. Around lunch our neighbors knocked on our door. “Yes!! Is it here?” Matthew asked, gleefully, like a little kid on Christmas. Matthew thought about it for about .68 seconds before dashing over to the building. Sure enough, there sat a television in a box. With our name on it. It was a Samsung, 50″, LED television with more bells and whistles than I would even know what to do with. But, it was not what Matthew ordered. Which means that the original item probably wouldn’t arrive in time for Thanksgiving. Matthew was crushed. I was confused. Finally, Matthew confessed that he had ordered a countertop dishwasher. A really nice one that he was confident would hold all of our dishes from a meal, plus the cooking things, and we would do great. I was even more dubious. I pictured a countertop dishwasher taking up my precious counter space and not being good enough so that I’d still be pre-washing dishes before loading them. And, surely, it wouldn’t be big enough to hold my largest pots (which, because they’re European, aren’t super large, but still). So, now we had a ginormous television and no dishwasher. Matthew found a phone number for Amazon France and called them. He got pretty far in French (this was back in November, remember) before finally talking to a manager, who also spoke English. Note: the French and the English were all with an Indian accent. So, yeah, according to Amazon, we received a dishwasher and there was NO RECORD of a television for any reason. Let’s back up for a second, though, but the hilarity was what was going on in the building. This giant television had been sitting in all its worldly glory in the hallway of the school, passed by all who live here, with our name on it. 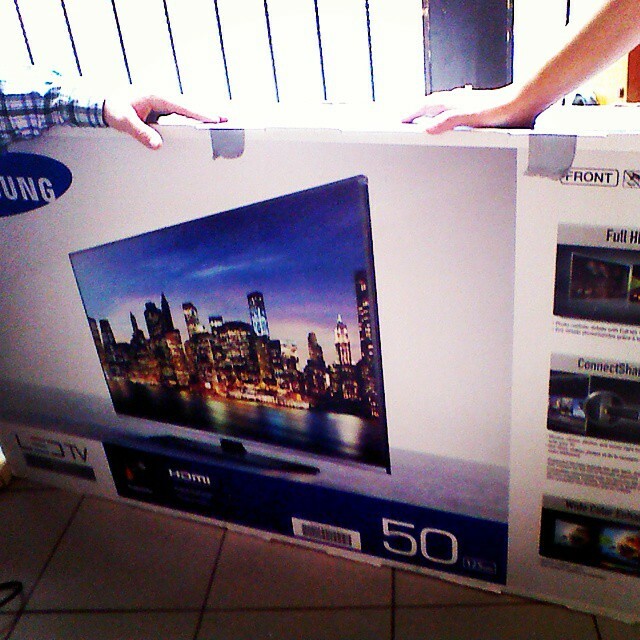 We are missionaries who ordered a giant television just a few months after being at language school. Oh the comments! Because some thought we really ordered it! It was so funny, but also a little embarrassing! Saying we had ordered a dishwasher didn’t actually help, but here was Matthew’s logic: we would spend 1.5-2 hours each day washing dishes by hand. Adding up how many days left in language school (in November), buying the dishwasher was equivalent to paying ourselves a euro a day. Our time was deemed worth more than that, so Matthew bought the dishwasher. Practically speaking, one of us would do dishes by hand while the other hung out with the kids. If both of us wanted to hang out with the kids, then we had to wait until they were in bed to do dishes and homework and everything else family and house life demanded. Basically, in Matthew’s mind, it was worth it! Amazon, after a few more calls, said they’d send a new dishwasher out (to replace the one we were sending back, so they thought) and would pick up the unwanted “dishwasher.” Whatever. We took the giant TV to the administrators office and explained the plan to her so she could talk to the courier. Except one never showed. One day, two days, a week, two weeks. We finally took it back and put it in our hallway, praying Axel wouldn’t decide to climb on the box. Meanwhile, the dishwasher, the real dishwasher, arrived on Saturday, just after I had finally caught up after the Thanksgiving chaos. Matthew was able to install it. It was beautiful. It was big enough to hold everything, even my largest pot. It was quiet. It only used 1.5L of water on it’s most economic (and effective) setting. We even found a desk we weren’t using for it to sit on, saving all of my counter space. And, no pre-washing dishes – it did (and still does) an amazing job. It was exactly what Matthew expected and blew me out of the water! But the TV was still in our hallway. Christmas break was suddenly upon us and we had given up on Amazon. The phone calls did nothing, the emails back and forth confirmed that, according to their records, we had a dishwasher. And, if the dishwasher wasn’t returned by January, we would be charged…we would be charged for a dishwasher. The dishwasher was considerably less than the price of the tv (by 500 euros)! We did our part to try and communicate with Amazon, but they wouldn’t veer from their script. The TV didn’t exist. So we did what any American family would do with a TV they couldn’t get rid of, we set it up for Christmas movie watching! We didn’t have room at our place, so we set it up downstairs at our friend’s apartment. They were waiting patiently for their baby to be born and happily hosted many Christmas movie nights. We would list it on the local version of craigslist after the break was over. The new families came onto campus in January. One family was staying in France for their mission work, he is a pastor, and we invited his family over. They were curious about the dishwasher and we sang its praises loudly. So much so, that they decided to buy it from us right then and there…once we leave this summer, of course. And they still remind us often that it’s theirs (they even offered to pay, but we trust them). Bam, done. But the TV still sat. We got a few offers on the website, but nothing worth taking. Finally, I mentioned it at school to a couple that had missed the story. The story, by the way, had become rather infamous, about the Linds ordering a giant television. Or that, perhaps, they had a generous supporter. This couple, too, was staying in France, to work with college students. College students appreciate giant TVs, right? And, for the cost of a dishwasher! We finally sealed the deal a few weeks ago. So, a giant television that Amazon doesn’t know it lost has now entered into service for Jesus. The dishwasher was sold to a former professional chef, now a PCA pastor, whose skills will also be used for Jesus, and he’ll have more time thanks to an amazing dishwasher. And, in the meantime, I really don’t know how I would’ve survived without a dishwasher all these months. Really really. My husband is a genius and I am very grateful.